Rhinos are lovable lummoxes, herbivores who roam grasslands and forests nibbling on foliage, fruit and grasses. When left alone, they can live for over 40 years in the wild. Able to reach speeds of up to 35 miles per hour, they are still not fast enough to outrun, or small enough to hide from, human hunters. As such, today there are just five remaining species of rhinoceroses: three Asian and two African. 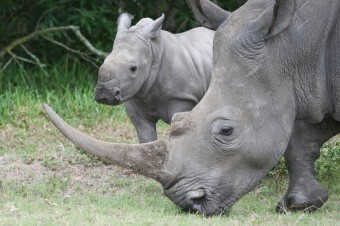 With out further ado, I give you 12 interesting rhino facts for your reading pleasure. 1) A Rhino’s horn’s structure resembles a horse’s hooves. The outside is composed of soft keratin, not unlike hair and fingernails, while at its center there are dense deposits of melanin and calcium. If the horn breaks off, the rhino can grow a new one. 2) People have treasured rhino horns throughout known history. The horns have been carved into paperweights and hairpins, cups and dagger handles with its translucent beauty highly prized by artisans. It has also historically been prized for its supposed medicinal qualities and even today in places like China, India and Malaysia, rhino horns are ground and used to treat a variety of ailments including fever, headache, gout, rheumatism and food poisoning. Although extensive research has been done to try to verify the medicinal value of a rhino horn, only one has shown even a slight correlation between rhino horn and improved health. 3) Just how valuable, monetarily speaking, is a rhino horn? In some places, such as Vietnam, a large rhino horn can run you one quarter to a half million dollars U.S. Because the horn is so valuable at present, many think the only way to stop poaching is to simply try to domesticate the rhino as much as possible and begin farming them for their horns, which would simultaneously drive down the price of a horn and establish a legal market for it. In fact, in some areas, to potentially save the rhino from poachers, the rhinos are incapacitated, then have their horn removed, effectively making them temporarily safe from poachers until the horn grows back. Full grown rhinos, even without their horn, are pretty much at the top of the food chain, besides humans, so some find this to be an acceptable way to try to stop poaching and preserve the rhino. Although, removing the horn does potentially cause problems with its ability to defend itself from other rhinos. 4) For the ancients, the rhino horn was thought to hold magical properties, such as the ability to purify water or be used to detect poisons in drinks. Surprisingly, the latter quality may be true. Because of the horn’s composition, today some believe that strongly alkaline poisons may have produced a chemical reaction inside a cup made from the horn. 5) Africa is home to both species of white, as well as the black, rhino, although the former isn’t white and the latter isn’t black (they’re really both grey or yellowish-grey, looking very similar). In fact, the main distinction between the two species is that black rhinos’ mouths are designed for eating foliage, while white rhinos’ lips are broad and flat, better for grazing. So why are they called “black” and “white” rhinos? For black rhinos, they were simply called this to distinguish them from white rhinos. For white rhinos, nobody knows for sure, but it’s thought that perhaps they were originally named this after the Afrikaans “wyd”, meaning “wide”, so not in reference to their color, but their broad, flat mouths. The theory goes that this then morphed into “white” in English. 6) An adult rhino’s skin can be as much as 5 cm (2 inches) thick, with typical range of thickness across species being 1.5-5 cm thick. 7) “Rhinoceros”, the name, comes from the Ancient Greek “ῥῑνόκερως”, meaning “horn nose”. 8) Rhinos first popped up around 50 million years ago, probably branching off from the Hyracodontidae family of animals. 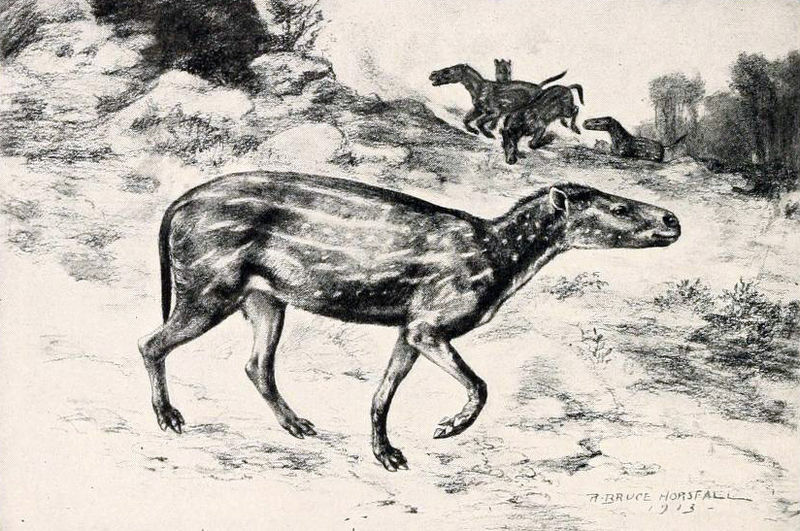 This group looked a bit like horses with the smallest around the size of a dog and the largest, Paraceratherium, thought to be the largest land mammal in history at 16 feet tall at their shoulder height, 26 ft long, and 18 tons in weight. 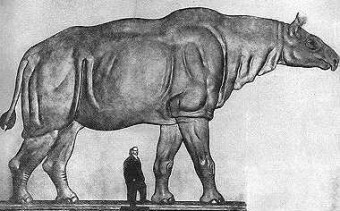 9) There was once “woolly” rhinos. The oldest known fossil of one comes from about 3.6 million years ago in Tibet. These strongly resembled white rhinos in size and shape, but they had hair and were well suited for cold climates. 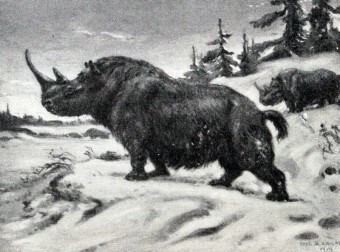 These rhinos were often depicted in cave drawings and it is thought that they went extinct around 10,000 years ago, possibly due to being popularly hunted by humans and, more likely, diminished due to drastic climate changes that occurred around that time- The Younger Dryas stadial (the Big Freeze), which started around 10,850 BC and lasted around a thousand years being the culprit. 10) In Asia, only the Sumatran (Dicerorhinus sumatrensis), Indian (Rhinoceros unicornis) and Javan (Rhinoceros sondaicus) species survive today. Each is either on the endangered or critically endangered list. The Indian rhino used to roam across India up to Pakistan, Nepal and Bhutan and down to Burma and Bangladesh; today it is found in small groups in limited places in India and Nepal. Members of this species have one horn that can be anywhere from eight inches to three feet long. Males can weigh up to 7000 pounds (3.5 tons) and stand over 6 feet tall! The Indian rhinos’ numbers, however, have been on the rise, having grown from about 200 in 1900 to just over 2500 in 2007. On the critically endangered list, the Sumatran rhino faces extinction. Only 250 adults remain today and populations are expected to decline by 25% over the next 20 years. Formerly found throughout Southeast Asia, as far west as India and as far north as China, today it is only known to reside in Sumatra and parts of Malaysia, although hidden populations may exist in Indonesia and Myanmar. The Sumatran rhino is the smallest of the family, standing about four feet high, stretching to about 10 feet long and typically weighing less than one ton (about 1500 pounds). This is the only Asian species with two horns, and its largest horn can reach about 2.5 feet in length. Because they stray into high altitude habitats, Sumatran rhinos have a fair amount of hair. The Javan rhino can reach 10 feet in length, stand over five feet tall and weigh over 4000 pounds (2 tons). The males’ horns can reach 10 inches in length, while the females are hornless or have tiny bumps. Sadly, the Javan rhino is also facing extinction. There are about 50 individuals remaining in the wild, in the Ujung Kulon National Park, and none in captivity. In 2011, a subspecies in Vietnam went extinct. 11) The Black rhino (Diceros bicomis) is found across southern, central and southeastern Africa. Male black rhinos can reach 13 feet in length, stand over five feet tall and weigh up to 4000 pounds (2 tons). Their horns are typically about 18 inches long, although overachievers have been known to sport horns that were nearly five feet long. It has been reported that up to half of the males and nearly one-third of black rhino females die from infighting. To make matters worse, heavy poaching has decreased the population from about 70,000 in 1960 to 15,000 in 1981 to a low of bout 2400 in 1995. Of the four subspecies, three are listed as critically endangered and the fourth, the western, was declared extinct in 2011. On a brighter note, the remaining subspecies’ populations have rebounded a bit through strong conservation efforts, and as of 2010, their numbers had grown to nearly 5000 individuals. 12) There are two species of white rhino: northern and southern. They can grow up to 15 feet long, stand over 6 feet tall and weigh over 7000 pounds (3.5 tons). Both have two horns on their snout, with the larger (in front) averaging nearly 3 feet and, on the truly exceptional, reaching almost 5 feet. Sadly, the northern (Ceratotherium cottoni) is nearly extinct, with no known individuals existing in the wild; those that remain are so few, that we know most of them by name: Suni, Fatu, Sudan and Najin. Conservation efforts with the southern white rhino (Ceratotherium simum) have been a wild success (pun intended). In 1900, only 100 individuals were known to exist. Today, over 17,500 are alive and well, mostly in South Africa.